Cover Artists Sara Pichelli & Marte Gracia, I didn’t even notice Kitty was on the cover until my second read through. 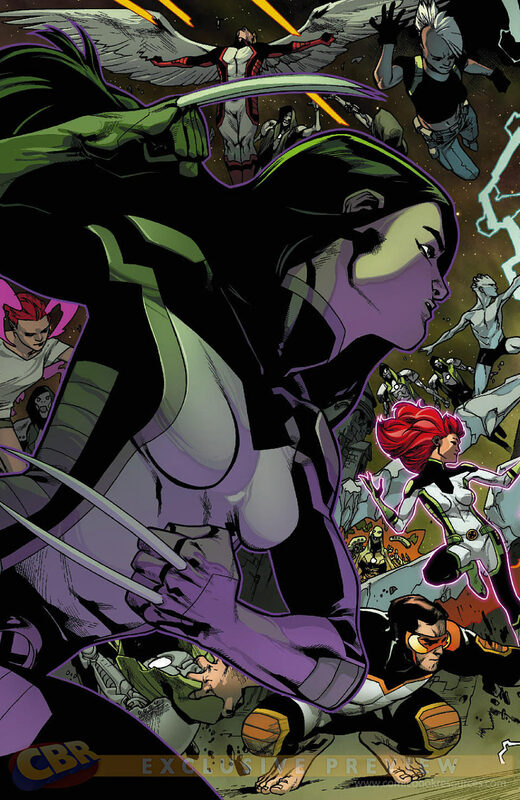 It took three issues but we finally get confirmation that the broad in the white shirt is Ultimate Shadowcat, gone is the purple tint, so they must have got a lot of response to that. Plus, she gets dialogue this issue, so that helps. Castle Doom. Latveria. Now. The Two Icemen can’t believe how this day is going. 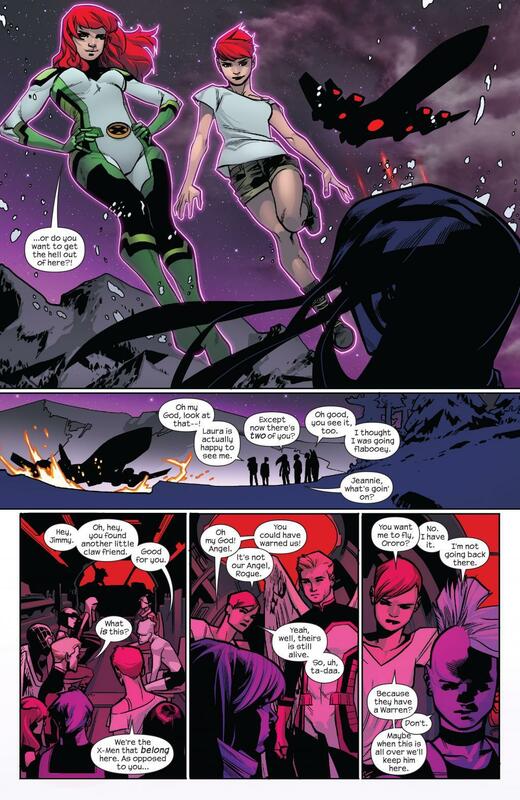 Spider-Man calls Rogue, Rock, as he honestly thought that was her name. It must have made sense to him. Angel compliments Ultimate Iceman, as he is great with his powers – which makes him realize that he isn’t his Iceman. Ultimate Jean, I wish there was an easy way to distinguish the different pairs of the characters but I can’t think of one, gets hurt and Beast is concerned. 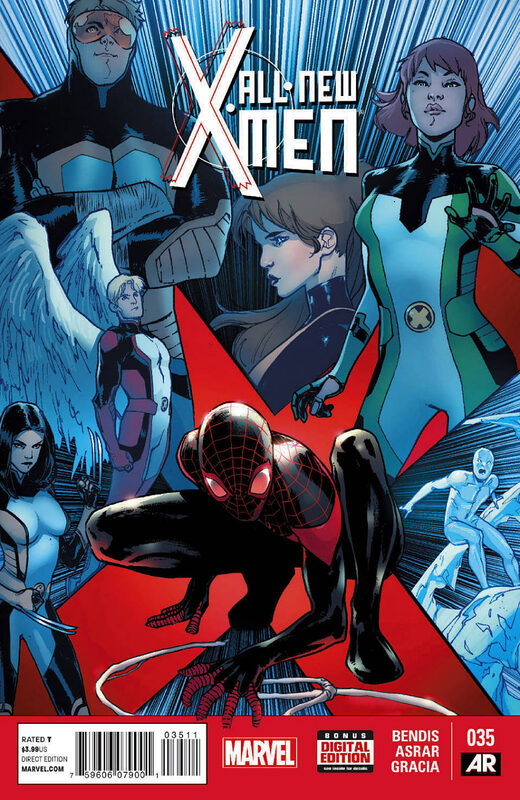 X23 and Spider-Man get back to back, he calls her, Lady Wolverine, and that will be the last time he tries that nickname. All New Jean wants to get other Jean off the battlefield. Spider-Man charges and jumps at Doctor Doom and he starts to blast Spider-Man out of the air. Hours Before, Revenge style. The Xavier School for Gifted Youngsters. Closed. The Cerebro Room. Invented by the late Charles Xavier. Detects Mutants All Over the World. All New Jean has located her teammates and the Ultimate version of the lady mutant who sent them here in the first place. 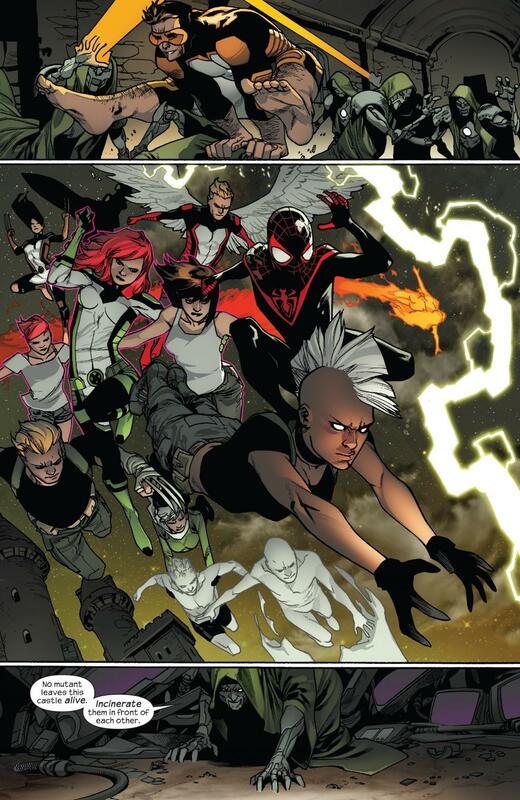 Ultimate Jean offers to take her X-Men to locate the All New X-Men. Latveria. Doctor Doom reminds Beast, and us, that Beast is under his complete control. Doctor Doom has a broken time cube and he wants Beast to make it into a dimensional portal. Weapon X. Hidden in the Canadian Wilderness. X23 is slashing away at a defenseless tree. She isn’t taking it well that humans created mutants in the Ultimate Universe. Angel doesn’t like seeing her like this. He calls James, little Wolverine. It makes perfect sense to go for Angel and X23 first. One, you get two mutants that way and two, X23 is always useful. X23 isn’t happy about seeing two Jeans. Everyone hints at how Ultimate Angel is dead. 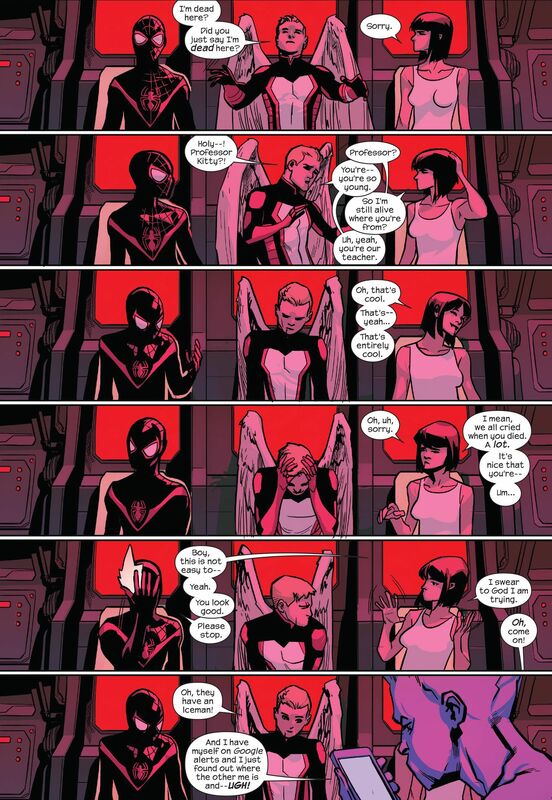 Such a great page with Spider-Man and the sweet sweet confirmation that this is Ultimate Shadowcat. I would imagine that Miles and Kitty would have more to say to each other but that probably explains why Spider-Man sat near her. Angel recognizes Shadowcat as a young Kitty, she is happy about her older self being a teacher. Angel notices Ultimate Iceman and he takes the opportunity to explain that his All New counterpart is in Atlanta. Atlanta. Bobby is trying to power up but even at night, it is hot. The police locate him, it starts snowing and he ices up. He meets Ultimate Storm, and I like how he doesn’t really know her as he barely spent any time with anyone who wasn’t from the 60s. Beast is writing a timeline on a chalk board, I believe this is the third such timeline to appear in this title. Doom is told that a plane has entered his airspace. After revealing that the X-Men have a mutant tracking device, Cerebro, and Doom wants one now. 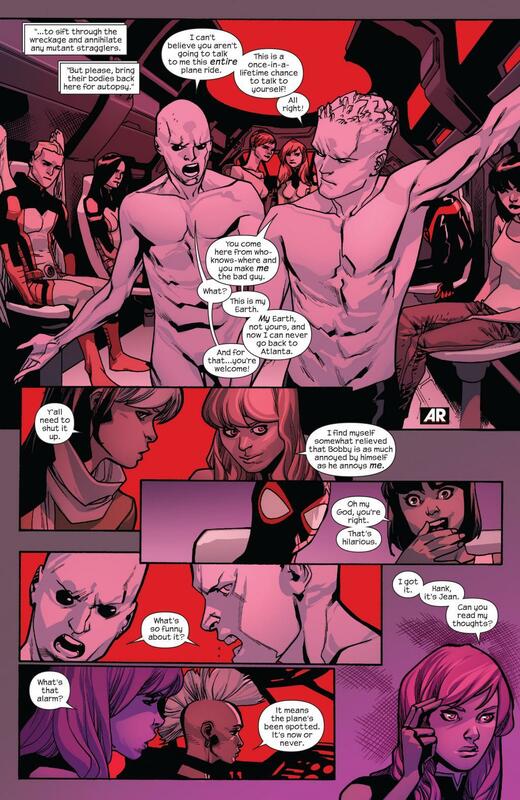 All New Iceman is upset that Ultimate Iceman isn’t engaging him enough. He is used to his present day self talking to him frequently and even his even further in the future self, chatting with him. Everyone is ashamed of All New Bobby. Jean reaches out to Hank, he tells her how he is under Doom’s influence. Ultimate Jean has the sad duty of explaining that Ultimate Doom’s real name is, Victor Van Damme, it was the media that gave him the much better name. The Jeans are undoing the mind manipulation that Doom did to Beast. Beast starts fighting Doom. Doom gives the order to have all mutants killed. I do like how now, Kitty clearly has brown hair and no purple tint, what was that about? It lasted two issues. 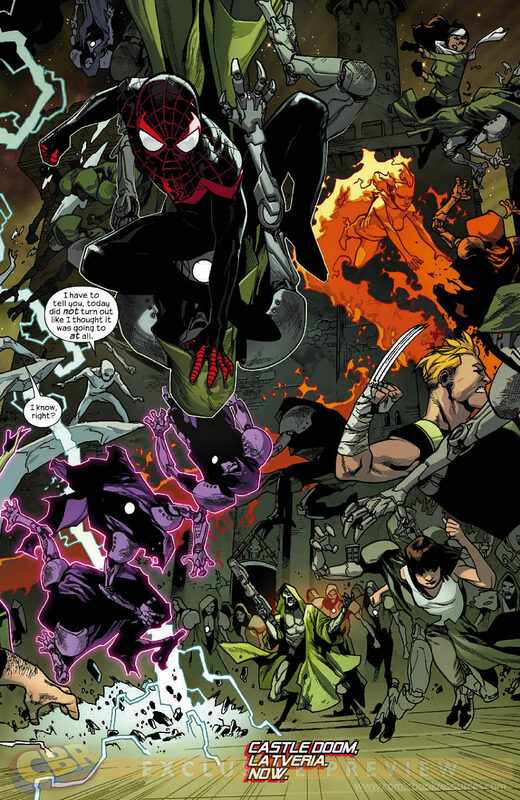 Issue ends like how it started, Spider-Man about to jump at Doom and a giant explosion at the castle. The Top 9 Comics of 2015!